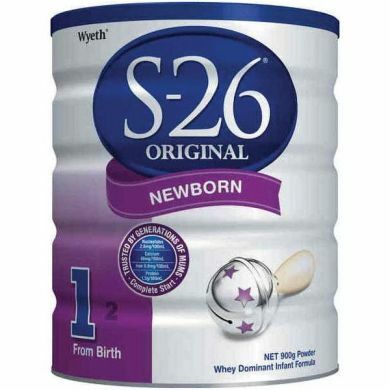 S-26 is a trusted, quality infant formula, providing important nutrients for your baby during this time of rapid growth and development. If formula-feeding, infant formula may be the sole source of nutrition in the first 6 months of your baby's life, and choosing an infant formula is an important decision. Generations of babies have been nurtured on S-26. The 3 step 'S-26' nutritional plan will ensure that your baby receives quality nutrition to meet their needs at each step of their development, from birth to 'toddlerhood'. Reduced minerals whey; vegetable oils [palm, coconut, oleic (sunflower or safflower), soybean]; non-fat milk powder; lactose; emulsifier; (soy lecithin); L-cysteine; taurine; nucleotides (cytidine-5'-monophosphate, disodium uridine-5'monophosphate, adenosine-5'-monophosphate, disodium inosine-5'-monophosphate, disodium guanosine-5'-monophosphate). Minerals: Calcium chloride; potassium bicarbonate; sodium bicarbonate; potassium hydroxide; ferrous sulphate; potassium citrate; zinc sulphate; calcium hydroxide; copper sulphate; potassium chloride; manganese sulphate; potassium iodide; sodium selenite. Vitamins: Vit C, vit E, niacin, vit A, calcium pantothenate, vit B1, vit B6, vit B2, vit D3, natural beta-carotene, folic acid, vit K, biotin, vit B12. S-26 protein source is non-fat milk and reduced minerals whey. Contains milk and soy lecithin. Always wash and dry hands before preparing formula. Wash bottles, teats, caps and knife. After washing, sterilise by boiling for 5 minutes. Keep bottles capped until use. Boil fresh drinking water for 5 minutes. Allow to cool. Consult feeding guide on can for quantities of water and formula. Prepare each bottle individually. Pour in cooled boiled water. Fill the provided scoop with S-26 and level off with knife. Always add 1 scoop (8.5g) per 60mL water. Cap bottle and shake. Test temperature on wrist before feeding. Discard any unfinished feeds. Use contents of can within 4 weeks of opening. Keep can closed with plastic lid and store in a cool, dry place (eg pantry).